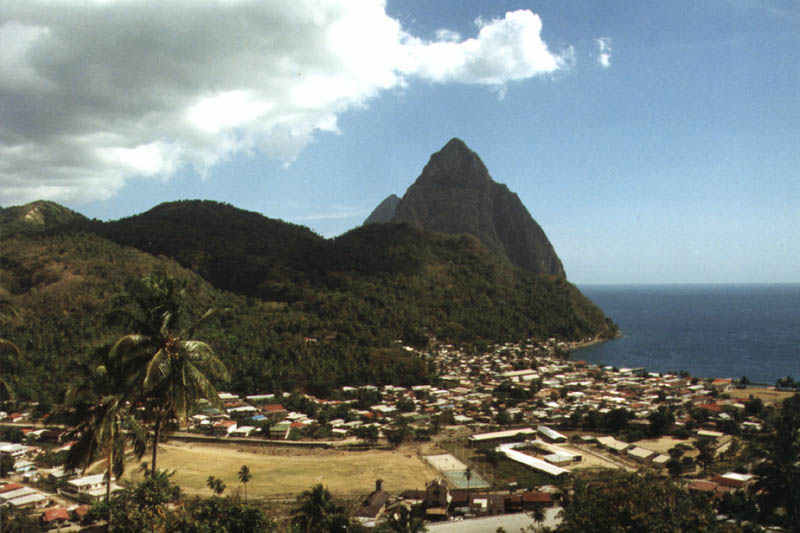 During the period April 9th to April 16th, 1996 my wife and I visited the beautiful island of St. Lucia in the windward islands of the Caribbean. Since we found posts on the net helpful in choosing a spot, I thought it only fair to do my own bit to help others. So, here are some facts along with my observations and opinions. While we were naturally concerned about how we'd like it, I'm happy to say it was one of the most delightful vacations we've ever taken. I travel quite a bit and I've become pretty hard to please but, happily, I was absolutely delighted with almost everything. We were both very sorry to leave and will be eager to return. Sad to say, but the worst thing about some of the islands we've visited in the past is the attitude of the locals. We've had the impression that they'd have been happier if we'd stayed home and mailed them a check! The opposite is true of the St. Lucians. From the moment we arrived, we felt we were truly welcome. Even people trying to sell trinkets were polite. Unlike on other islands, they even accepted a "no, thanks" graciously. We had no really unpleasant experiences with people and most experiences were downright pleasurable. 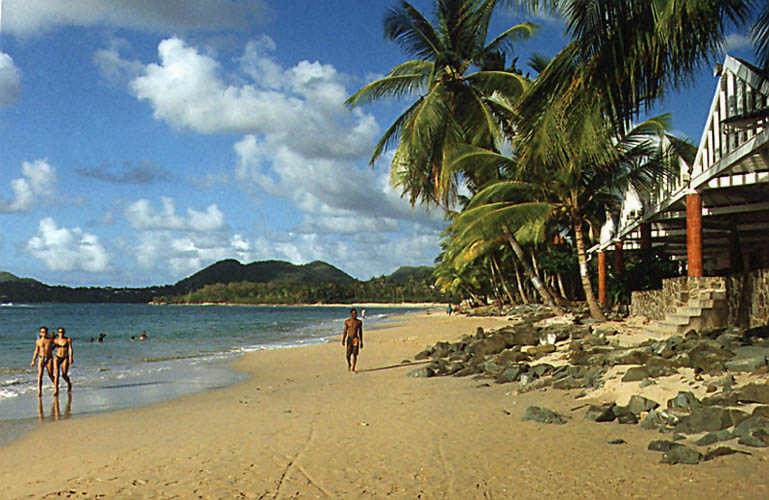 St. Lucia is just south of Martinique and west of Barbados. 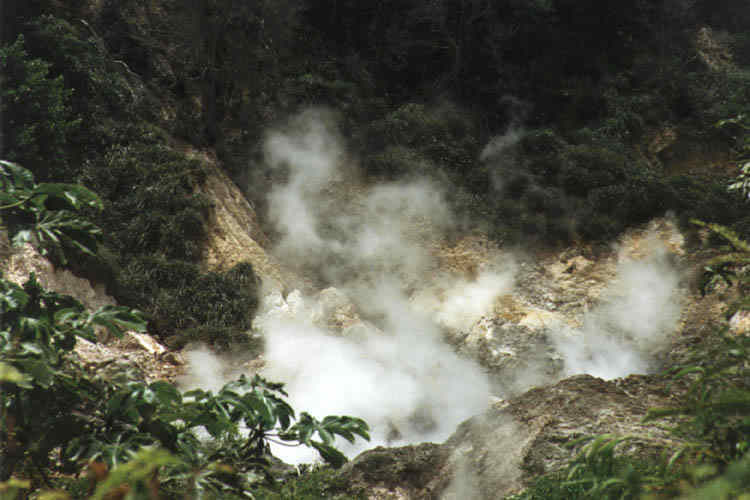 It is of volcanic origin and very rugged. Getting from point A to point B is always an adventure. 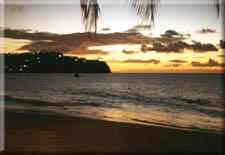 The ride from the international airport (at the south end of the island) to the capital of Castries near the north end takes about 1-1/2 hours. The roads are narrow and among the most steep and crooked I've ever seen. Adding the fact that guard rails are unheard of and that driving is on the left-hand side of the road, the drive is "stimulating" I rented a car but don't highly recommend it. The reaction of the hotel staff upon our arrival at the gate was "You DROVE?" That said, the result of this ruggedness is an unparalleled beauty. Sharp, lush green mountain plunging into the blue that's only seen in tropical waters. Magnificent. 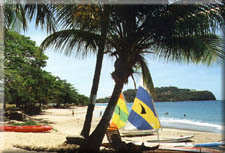 The main industries of St. Lucia are tourism and bananas. We drove for miles through a banana plantation. As on many islands, there's a lot of poverty. 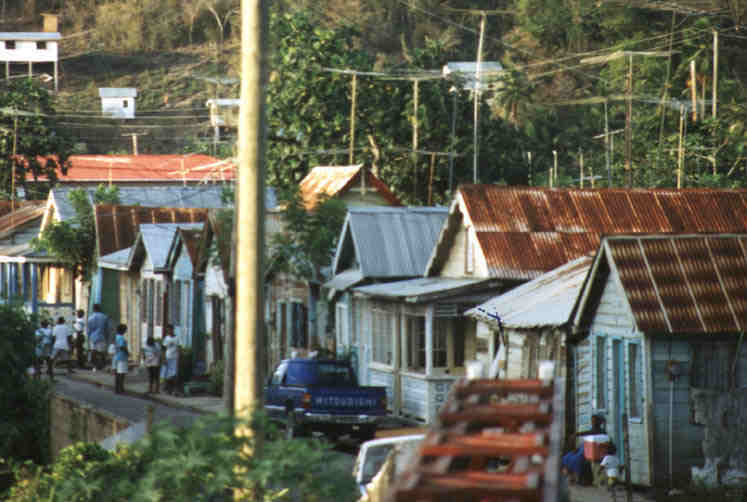 Shacks sit immediately next to homes that are quite nice. We opted for a relatively low-cost room and were quite happy with it. It was back from the beach and on the second floor. Our balcony overlooked one of the pools and the gardens and had a view of the Caribbean somewhat blocked by the roof of the restaurant building. The room was large and bright with marble floors and a four-poster king sized bed. It was clean and well maintained. The beach is very nice and is part of a long stretch so you can take long walks on the beach if you want. None of it is the least bit crowded.If you like heavy surf, you'll probably be disappointed. At least during our stay there was never more than a very gentle surf. They have small sailboats, wind-surfers, and ocean kayaks readily available. If you know how to use one, you simply put on a life vest and take it for as long as you like. If you need instruction, they provide it whenever you want. Water skiing works essentially the same way but it may have only been available at certain times, I'm not sure. Scuba is also available. If you're not certified, you can participate in a training course. It's included in the rate but is an all-day affair. I wanted to do it but didn't want to invest 1/7 of my stay. 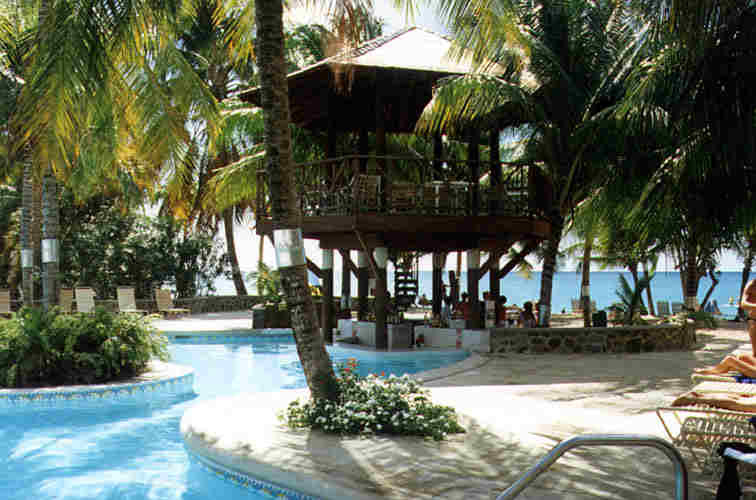 There are two pools, one, near the exercise room, fitted with a volleyball net and one with a swim-up bar. Each has a whirlpool nearby but neither the heat nor the turbulence was anything spectacular. There's all the normal beach volleyball, etc. that one would expect. 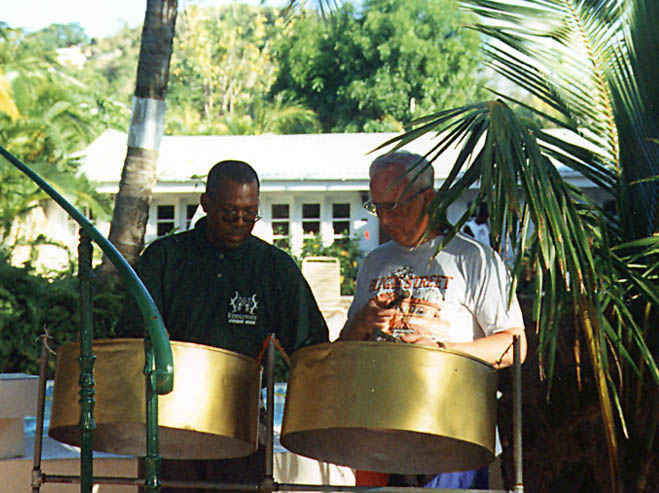 Every day, there was a long listing of planned activities -- regattas, steel band lessons, etc. but no pressure to do anything. There are two restaurants at Rendezvous. 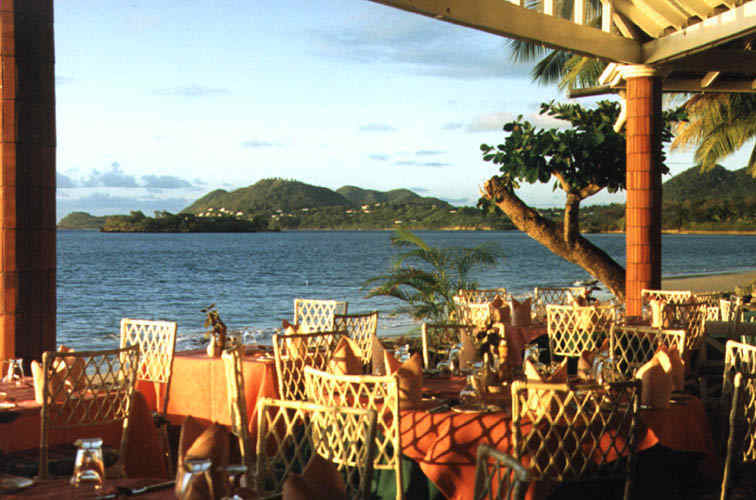 All three meals and an afternoon "tea" are available at an open terrace restaurant just above the beach. For breakfast, there was a cold buffet and waitress service is available for the normal fare of eggs, pancakes, etc. Lunch is buffet and is very extensive. It's really equivalent to a dinner buffet anywhere else, including carving service for such things as turkey, lamb, ham, etc. At "tea time" there are some delightful delicacies served on the terrace. For dinner, there are two choices, a buffet on the terrace or a more formal dinner in "The Trysting Place". The Trysting Place is a very well appointed restaurant with two dinner choices nightly. The choices were creative, delicious and delightfully presented. We ate there every night but two. The only restrictions for The Trysting Place are that reservations are required and there's a dress code. The dress code was very liberal, however, simply prohibiting such things as shorts; no jacket or tie was required. Wine was available at lunch and dinner in apparently unlimited quantity and, for the house wine, at no cost. Other wines were available at (modest) additional cost but we were quite happy with the house offerings. Again, I'm terribly critical of food and I was quite happy with the quality of what was provided. True, there were a few things that weren't great (like pancakes) but overall, I was quite pleased. For people who like to drink, there's almost always a bar open and they have branded liqueur as well as bar stuff. All drinks are included in the rate. They have Heineken beer but the local brew, Piton, is quite good. 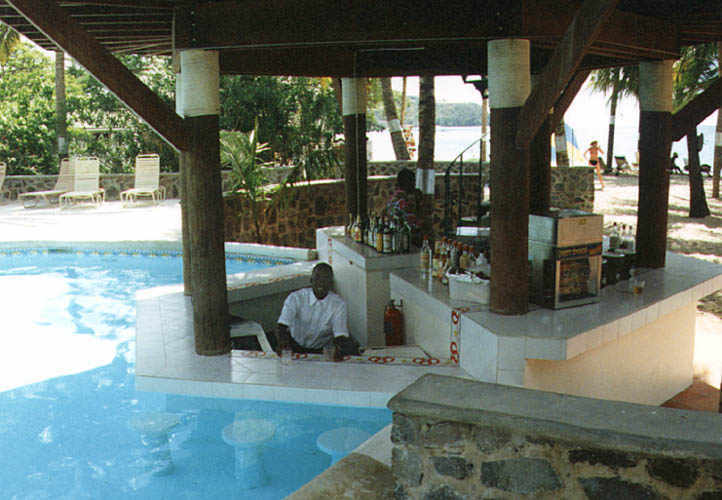 The pool bar opens at 9:00 AM, then the Terrace Bar, then the Piano Bar. The Piano Bar stays open "'til the last guest retires". We spent a few very late nights in the piano bar. 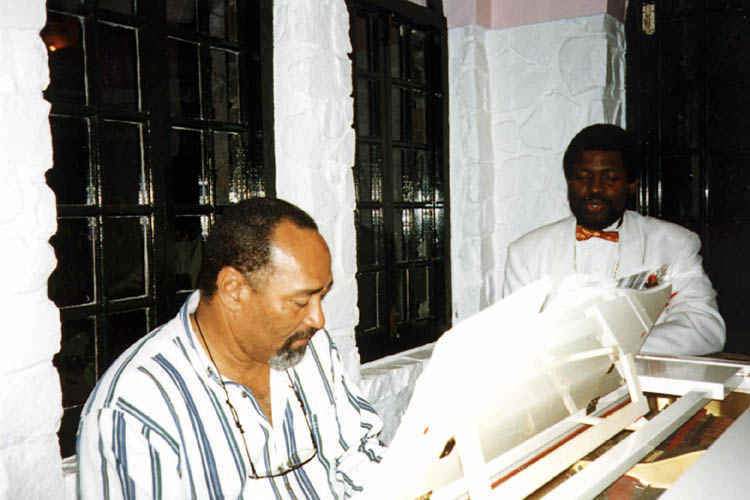 The pianist, a St. Lucian named Basil, is very talented (if you can hum it, he can play it) and people like to sit around the piano, talk to Basil and sing. The Piano Bar also serves coffee, tea, and sandwiches 'til they close. A number of off-site tours were included with the package. We took a walking tour of Pigeon Island (more later on that) and a catamaran/snorkeling tour. The catamaran took us south to Anse Cochon for snorkeling. The boat ride was great but the snorkeling wasn't. 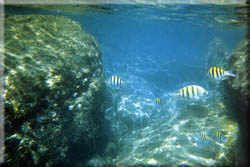 The spot was crowded with other boats and "zillions" of snorkelers. 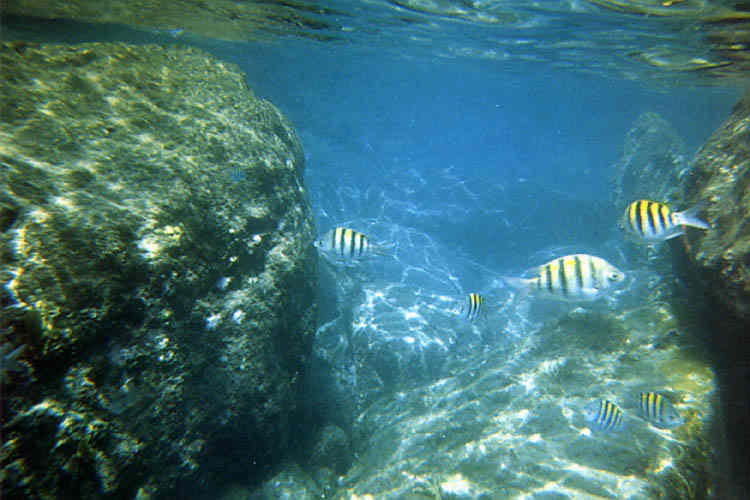 In my opinion, the water was not clear by Caribbean standards and the reef was pretty badly damaged; perhaps by storms or perhaps by tourists. People who'd never snorkeled in the Caribbean before found it great but those who have a basis for comparison probably won't. One other thing. They provided masks and snorkels but no fins. To me it didn't matter since I brought all my own gear. The people at the hotel were perhaps even nicer than those found elsewhere. The friendliness seems genuine and since tipping is strictly prohibited, I suspect it is. The staff often eats and drinks with guests. 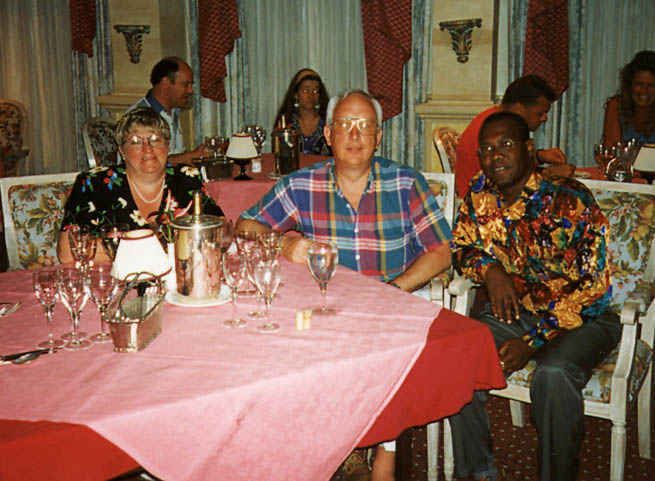 We had staff members join us on several occasions, sometimes at our request, sometimes at theirs. I guess there are some who wouldn't want to socialize with the "help" but we found it delightful and a wonderful way to learn about the island and its people. 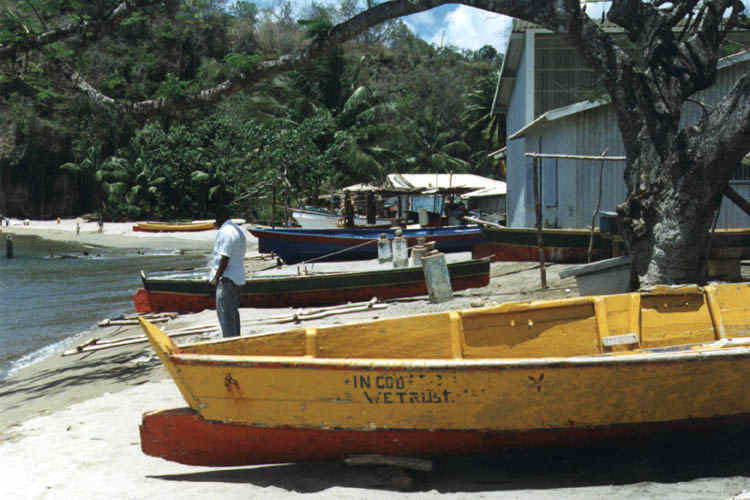 At one point, I asked one of the staff how I'd drive to Marigot Bay which I wanted to visit the following morning. He started explaining the route and then said, "Say, I don't have to start work 'til 4:00 tomorrow, would you like me to go with you? I can show you some other places as well." We spent 3-1/2 hours of his personal time together! I will confess I forced a tip on him but his resistance seemed genuine so I'm sure it would have been perfectly OK if I hadn't. There's one distinct drawback to the hotel's location. It's right at the end of an airport runway. Fortunately, it's the small airport in Castries and, at least during our stay, there was only one jet (DC-9) a day but, starting about 6:30 AM, there were single- and twin-engine prop planes taking off quite frequently. To give an idea of proximity of hotel to runway, the end of the runway is immediately across the road from the entrance gate!. After a few days, I stopped hearing the prop planes, including the one at 6:30. The daily jet, however, is a show-stopper. There's talk about lengthening the runway (into the harbor at the other end) so that big jets can use it. If that happens, I think the noise might be unbearable. Otherwise, it wouldn't keep me away. 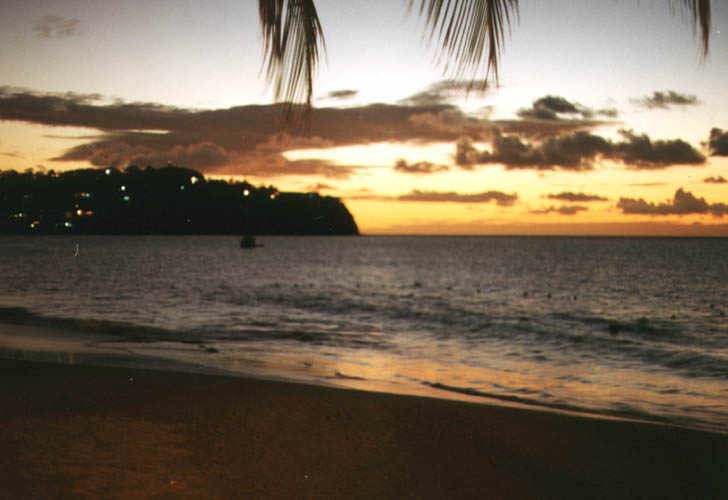 The city of Castries, the capital of St. Lucia, is home to about half its population and very close to Rendezvous. Traffic is bad, particularly on week days. The crowds are particularly bad when there are cruise ships in. We went shopping there on Saturday which is market day and enjoyed a few hours of shopping (which I normally detest). Even in the markets, the vendors were delightful -- a very different experience from, say, the straw market in Nassau. There's "Duty Free Shopping" at Point Seraphine which is at one of the cruise ship docks. The normal shops are there but that's not for me. 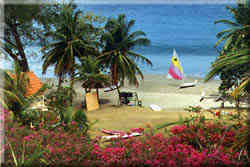 Pigeon Island, near the northern tip of St. Lucia, is now actually a peninsula, having been joined by a causeway some years ago. It was the site of one of the major battles between French and British (Each has had control 7 times!). There's a nice little museum depicting the history and a grueling but rewarding climb up a twisted path to a fort high above the sea. The view is worth the climb to sure-footed folks not afraid of heights. The most interesting trip we took was booked by the concierge but not included in the hotel rate package. It was a "Land and Sea" package that combined a boat ride (they said catamaran but we were on a trimaran) south to Soufriere with "Endless Summer" and a jeep ride back with "Trail Blazers". A van picked us up at the hotel at 8:30 AM and took us to the marina at Rodney Bay. The organization there was a bit lacking and we sat on the boat for perhaps 45 minutes before leaving the dock. In our case there were very few people on the boat and we had a delightful trip to Soufriere, the location of the two majestic Piton peaks which jut directly from the sea. By van we then visited the famed "drive in volcano" (glad I saw it - don't need to see it again) and the botanical gardens (ditto). A jeep then picked us up and took us to lunch before we started north. Lunch was at a restaurant with a beautiful view of Soufriere and the Pitons but with about the only less-than-friendly people we met. Not really rude, just not especially happy to see us. The road back made the winding one from the airport look like a Kansas interstate! Fourteen of us rode in the open back of an oversized jeep-type vehicle. It was nice to have the freedom to swing around to take pictures as we passed through the many small towns. On two occasions we left the paved road, once into a rain forest, and once onto a peninsula to an isolated cove for swimming. The rain forest trip was culminated by swimming under a waterfall in a cold, clear mountain stream. We arrived back at the hotel at 6:30. The trip was tiring but worth every cent of the US$70 per person. On our little side trip with our friend from the hotel staff, we visited several places worthy of note. Just outside the small fishing village of Anse La Raye is an old sugar mill. It's been turned into a sort of museum but has a bar and an outdoor stage for entertainment. 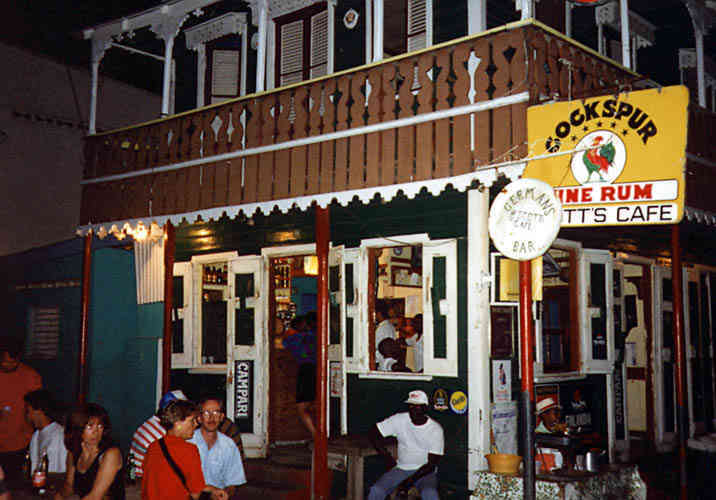 In fact, it was the site of the first St. Lucia Jazz Festival. It's a nice place to visit but they don't advertise much and one would never find it accidentally. 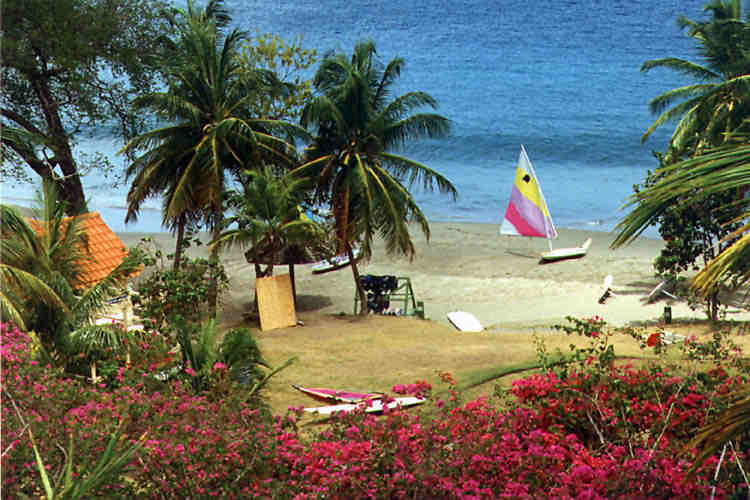 Marigot Bay is a well known departure point for sailboat charters. It's a beautiful anchorage and, if you love sailboats it's definitely worth a look. On the top of Morne Fortune, a hill overlooking Castries is the Sir Arthur Lewis educational complex. The school's buildings were formerly part of a military installation controlled at different times by both British and French. The view is magnificent. On the way up the hill, we visited two interesting shops, Bagshaw's Studios, where one can watch as silkscreen designs are created and the Eudovic Art Studio where artisans create wood sculptures. With Eudovic's price range from a few US dollars to thousands, there's something for everyone and we bought many things there for the folks at home (and ourselves!). 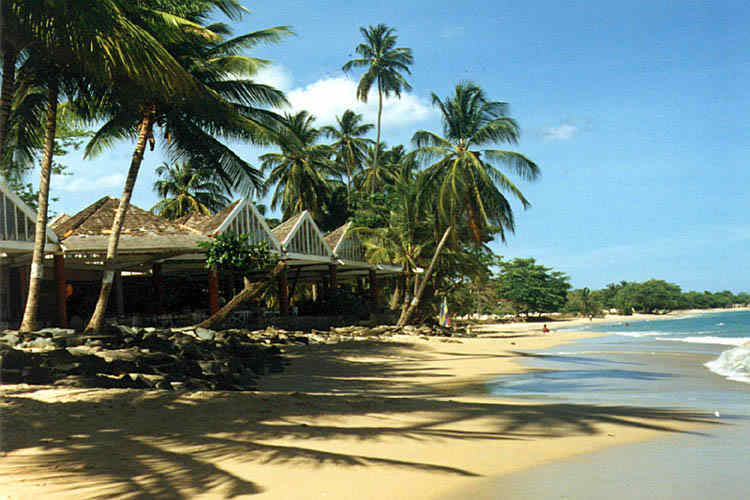 On Friday nights, there's a street festival in the small town of Gros Islet. We went but found it too crowded and confusing. Obviously, many people like it but I guess we're getting too old! As far as other exciting night life (casinos, etc.) forget it (at least as far as I could determine). We were looking for a quiet island and we found it. If you're looking for excitement, this isn't the place for you. I'd go back in a minute; to the same island and the same hotel.